For the eleventh consecutive year, on September 14, 2016, NNEDV conducted a one-day unduplicated count of adults and children seeking domestic violence services in the United States. 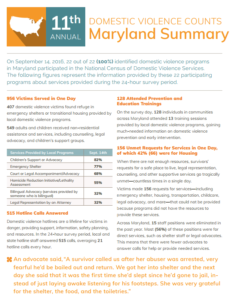 This annual census documents the number of individuals who sought services in a single 24-hour period, as well as the types of services requested, the number of service requests that went unmet due to a lack of resources, and the issues and barriers that domestic violence programs face as they strive to provide services to victims of domestic violence. This report is instrumental in raising awareness about domestic violence and the incredible work that local domestic violence programs do every day. The Maryland data included in the report, Domestic Violence Counts: A 24-hour Census of Domestic Violence Shelters and Services, found that there were 956 victims served across the state: 407 domestic violence victims (208 children and 199 adults) were served in emergency shelters or transitional housing; 549 adults and children received non-residential assistance and services, including counseling, legal advocacy, and children’s support groups. Additionally, 515 hotline calls were answered and 128 were educated in prevention and education trainings. On the same day, however, there were 156 unmet requests for services, including emergency shelter, housing, transportation, childcare, legal advocacy, and more—that could not be provided because programs did not have the resources to provide these services. This 156 unmet requests is up from 76 unmet requests last year. Programs reported that during the last year, 15 staff positions were eliminated, mostly in direct services (56%), reducing the number of advocates available to help victims. Download the NNEDV’s national report.